The 3rd highest mountain in Indonesia at 3,726 m, is also one of the toughest mountain to be climbed. Located on the island of Pulau Mutiara (translated to means Pearl Island, for this island is also famous for pearls), it is commonly known as Lombok both locally as well as globally. Separated by a straits from the more famous island of Bali, this is an Island, which is a good alternative to the bustling island of Bali for vacation, not as cosmopolitan but definitely still preserves all the charm of a rustic with spartan lifestyle. 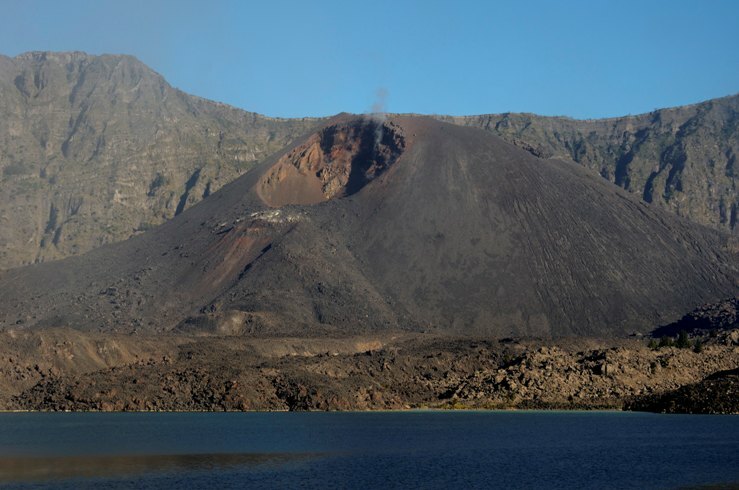 Gunung Rinjani itself is at the north of the island, and the bustling activities tends to be located as far away from this live volcano, which will be in the west and south. 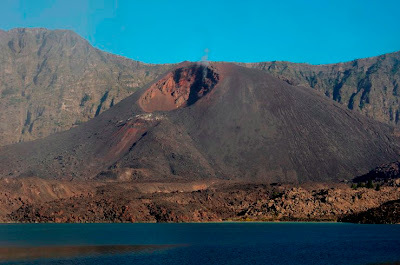 The island by the Indonesian archipelago standard is not big, and is dominated by this big lively volcano that can be seen from any part of this island with an unobstructed view. Gunung Rinjani which is an active volcano that last erupted about a year ago. It so happened I was on this very mountain when it was spewing lava in July 2009, that I stood at the rim of this volcano witnessing the magmatic event, then we were not allowed to climb to the summit nor go down to the crater lake as the volcano was rumbling and whistling like a runaway steam locomotive with the escaped steam. This year (2011) it was different, this volcano is at peace within itself; just some steam spewing out from its vents, and one has to look very closely to notice these plumes. Gunung Rinjani (July 2009) the centre black streak - that was caused by the lava flow. 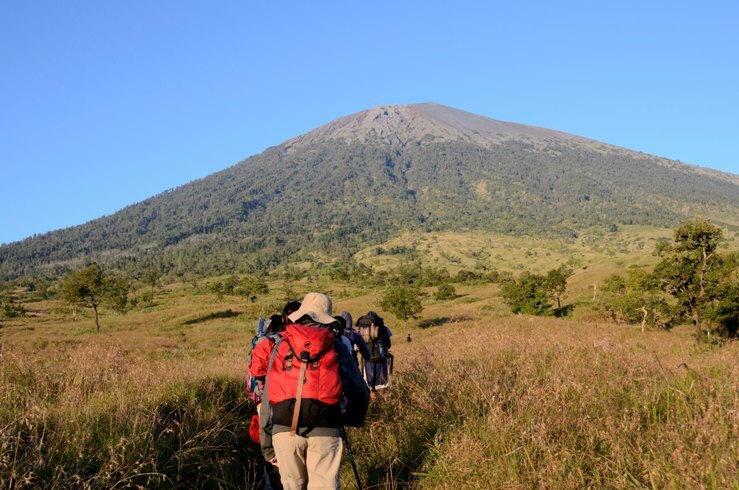 To climb to the rim, there are typically two routes, the easier one which we did in 2009 was to start and end via the Senaru Village, or the harder route which is by Sembalun Lawang. We chose the harder route for our climb, and did a crossover to the Senaru Village. For doing a crossover, this would entail the fact that you had to bring all your gears with you in your trekking. Climbing Profile of the track. The "valley" is the crater, where we have decended, and again the upward climb to the rim before heading down to Senaru Village. We arrived at Lombok international airport at Mataram, and were driven for hours to the Sembalun Lawang Lodge. By the time we arrived, it was almost midnight, this location is about 1200 m above sea level, and is surprisingly chilly! 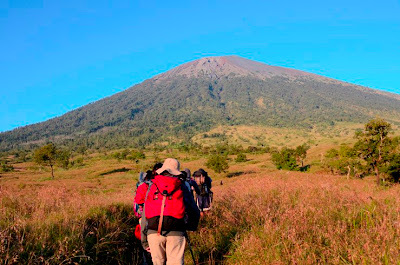 One thing I have noticed about Rinjani, is that the weather is like the desert, hot in the daytime, and cold at night. This very night, the temperature dipped below 10 deg C. Though we had a long day, very few of us were in the mood for shower, after all there were no hot water in the rooms, and worse some of us had no water at all! We retired quickly for the night, as the trekking began at 5 am, as we need to reach the campsite at the rim early so as to secure a good location, for good space is limited. Having to start off at 5 am, and with a few winks of sleep, we were thankful that this was the beginning of the climb which is less dangerous, after all our alertness had been compromised by tiredness and lack of sleep; and one false steps can lead to the abandonment of the climb. The journey to this campsite is most scenic, as the path crosses many interesting points. We walked in path with long grasses; crossed bridge over gully; seen the effect of the hot weather as we saw many dried riverbed; and most majestic will be the views of the volcano itself. Day 1 - still at the foot of the volcano, but we were already 1,100 m high. Walking through long grasses, despite the seemingly hot sensation, it was still quite cold in this early hour. The second part of this day journey is an incessant long climb up. Incessant as in having round one corner, one is faced with another round of climbing, and this would go on for hours as the path will zigzag up the volcano slope till finally one reaches flat ground, and that would also be the rim of the volcano, with one side leading to the crater, and the other side the foot of the volcano. By the time, we reached the rim, and the campsite at Plawangan 2 (2,639 m), we were so glad that the tents had been set up, and all we have to do was to plonk ourselves into the tent. But, the view here and at this hour of twilight was most fantastic. As the sun began to set, the particles in the air caused the sunlight to split from its pure form to produce the beautiful array of multiple hue of the light spectrum to give us this magnificent of dusk. After the last light, and the campsite was enveloped in veil of darkness, and then one lifted one's eyes to heaven, the heaven was speckled with dots of light and more amazingly the river of stars (milky way). We were witnessing our home in space, as the solar system joins the myriads of stars in our galaxy. The sun may have set, but we were still having some of the remnants of the sun light. As can be seen, at this altitude, we were above the cloud. Before we retired for the evening in the unusual time of 8 pm, we were told that we would be setting off at 1:30 in the morning to catch the sunrise on the summit. This meant that we were going to have a long climb ahead of us! We awoke with stiff muscles and back, as we had been sleeping on gravels, which is the primary substrate covering a live volcano. Once again the climb of the previous day was to be repeated, except that the intensity had increased, as the slope is covered with loose gravels and every steps on the gravels cause one to slip! Thus the saying of for every 3 steps, you slip 2 steps. At this juncture of the climb, it was more of 3 steps with 1 slippage! Still in such environment, one's muscle must be strong for climbing on such terrain, as the ground shifts under our weight. Initial Climb in the middle of the night. It was cold, and we were sored, but we were determined. Having strived, panted and possibly cursing under our breath, we arrived at the summit. At this vantage point, we were presented with a beautiful view of the island of Lombok of which this volcano sits. And even the neighbouring Bali highest peak, Gunung Agung can be seen. The unexpected highlight of the day was the surprise move of the proposal of a man to his beloved, at 3,726 m up and surrounded by clouds, this occasion, a rarity and most endearing to us who witnessed it. We wish the happy couple - Blessed Togetherness in the near further. After enjoying the view on the summit, the descent was most challenging, tiredness compounded with the unstable substrate assured a few falls for most of us. But we got the hang of it, by doing a dig, heel and slide motion. Digging into the gravels with the heel, and leaning backward as we slid downward, and thus saving energy in the process, to be repeated once the sliding stopped. Sliding has a downside and that is it is harder to control the direction of descent, and one would like to control the direction if the ridge is only about 1 to 1.5 m across. As it would be the crater or the foot of the volcano, a nasty slide of about 1,000 m on either sides. Not a comforting thought! Downward trek to our camp at the rim. At this point, the crater that we have passed during the night became obvious. In the crater, rise another "hill", this is where the real activity of the volcano takes place. The local called this Gunung Anak Baru (the young/child mountain). We managed to return to our campsite, and had our brunch before making another arduous descent to the crater (Senaru Lake). Today, the journey will be longer than the previous day, as we had to combine both the summit ascent as well as this descent. Arriving at a good time, we enjoyed ourselves by the lake. In as much as the water was warm and inviting, we were hesitant to go into the water for it was polluted with rubbish that has been carelessly discarded. The pollutants came in many forms, and the description is best left to the imagination of the readers. However, along the shoreline, there were many avid fishermen, hoping to land themselves a carp or two! Waking up at the normal hour unlike the last 2 days, we had to ascend from the lake and up to the rim to our next campsite. Once again, it was an incessant climb up, but definitely not as bad as the journey to the summit, or the journey down. The beginning of this journey was most challenging, as we had to negotiate narrow walkway around the lake, holding onto roots and branches for support. As we struggled to maneuver these obstacles, the porters with their heavy load were making us looked bad as they skillfully and agilely negotiated every turns without even using their hands. Must be the poles they used for balancing! Having given the choice of camping at Plawangan 1 or Pos 2, we decided to choose a longer journey to Pos 2 (1,500 m) for today, as it is located at a lower altitude which provides a more hospitable environment of milder climate. 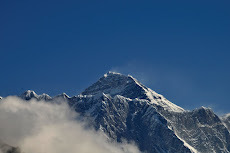 Plawangan 1 (at 2,641 m) is still at the rim, and we realised that it will be cold and may be plagued with water problem. The ultimate reason for us, is that the following day, we would have a shorter walk to Senaru village, which would be the end of this trek. But we were rewarded with the majestic view surrounding us. Final day of trekking, we walked from Pos 2 to our lodge in Senaru Village. But before the start of our trek, we thanked our porters, guides, and cooks for making this trip possible. After all, we were carrying our daypacks which only weighed between 5 to 12 kg, but the porters were easily handling loads of between 25 to 40 kg easily, and they still managed to walk faster than us. As we reflected on this climb, most of us who had climbed various mountains, mountains that are higher than Rinjani have to admit that this is one tough mountain. On the other hand, we felt a certain triumph of being able to reach the summit. Many had harboured thoughts of giving up as the ways were tough, but for those who made it to the summit, there were much psyching of our mind over body, and possessing the ever pressing on attitude to reach the goal. Such is our determination, and on further thoughts, we will be using this same determination with God's grace to overcome whatever challenges in any of our endeavours. A special thanks to Lois for proof reading my draft. 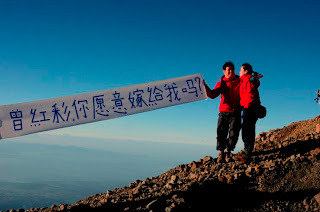 And a big thank you to Loh CH, my colleague and fellow climber for sharing the pictues.